Have a question with your Instant Shelter? You’ve come to the right place. Here are some of the most common questions we get at E-Z UP, and if you still have questions contact us anytime. Do E-Z UP® portable shelters really set up in seconds? They sure do! 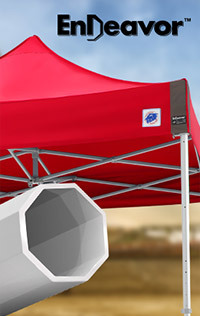 E-Z UP® Instant Shelters® can be set up in less than 60 seconds with just two people. Our patented one-piece frame with X-shape trusses creates an accordion-like structure that unfolds quickly for fast and E-Z set up. First time set-up requires the top to be installed. The top remains on the frame making every set up E-Z. Do you have a video showing proper setup & take-down? Check out this two-minute video for a step-by-step tutorial. For additional questions, please refer to your owner’s manual or contact our customer service team. Can I use my E-Z UP® portable Instant Shelter® anywhere? What about outdoors? 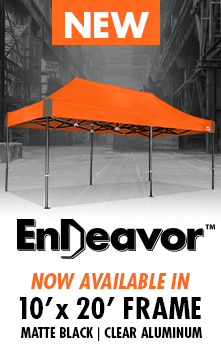 E-Z UP® shelters stand securely on grass, dirt, or pavement without ropes or poles. In windy conditions however, we recommend using our Heavy-Duty Stake Kit or Deluxe Weight Bags to anchor and prevent your shelter from tipping over. Where can I purchase an E-Z UP® Instant Shelter®? E-Z UP® Instant Shelters are available for purchase here on www.ezup.eu, in retail stores across Europe or through one of our authorized dealers. If you need help locating one of our dealers or need more information, please contact us at +31 (0)30 63 541 00. What size shelters do you have available? We know your needs may vary, which is why we offer a full range of models and sizes to accommodate you and your lifestyle. Sizes range from our 1.5 x 1.5m VUE™ or spacious 4 x 4m HUB™. The most popular sizes for fun in the sun is 3 x 3m, and for business use we recommend 3 x 3m to 3 x 6m depending on your needs. Our Shelter Advisor is a great tool to help you pick out the best Instant Shelter® for you! Contact us if you need more information or for help adding custom graphics. I have a plain shelter now; can you add custom graphics to it for me? What other E-Z UP® products do you make? E-Z UP® has a full array of products, including the E-Z UP® Instant Shelter®, E-Z UP® ProFlag™, ProUmbrella™, E-Z UP® Instant Table™, Directors Chairs, Bungalow® by E-Z UP and a variety of accessories. E-Z UP® products are used for fun in the sun, trade shows, corporate and community events, farmer’s markets, sporting events and much more. A full list of our products can be viewed here. Do you have any accessories available? Yes. Our full line of accessories includes custom sidewalls, railskirts, screen rooms, Deluxe Weight Bags or 11.3kg weight bags, Heavy-Duty Stake Kits, roller bags and more. What Fire ratings do your fabric items have? Our fabric meets CPAI-84, B1, & NFPA-701 Fire Resistant Requirements as well as others. You can find more information and our Fire Certifications here. How much wind will my shelter withstand and at what point are weight bags or stakes required? We recommend using weight bags or stake kits in all environments. While stakes are ideal to keep your Instant Shelter® secure during all outdoor use, our professional weight bags hold up to 20kg of sand, slate or similar material, and easily attach to your shelter for additional stability. Does a vented top help with wind? Vented tops are specifically designed for windy conditions, allowing wind to flow through the shelter, instead of directly hitting the top and tilting it over. Furthermore, our Dome® shelter combines wind vented peaks with new flex rod technology so the roof bends and flexes with the pounding force of the wind. I don’t have instructions for my shelter, how do I get them? You can find the owner’s manual for your shelter here. I have a canopy I purchased from company “XYZ”; will an E-Z UP top fit my current frame? Our tops are designed to fit E-Z UP® brand frames. We do not recommend using our frame or top with another company’s product. How do I know what existing model I have? Model numbers are placed on a sticker and located on inside of one shelter leg near the upper end. This model number will allow our Customer Service Representatives to identify the shelter model you have. Do you offer shelters with sports/collegiate team logos? Unfortunately we do not have any shelters with logos already printed. In this situation, the most common choice is a shelter with the team’s colours. I purchased sidewalls, what are the zippers for? The zippers are used to connect one sidewall to another. Many customers choose to purchase three sidewalls for a semi-enclosed space, or four for full enclosure. I am a non-profit organization; do I get a special rate? Yes, we provide discounts to non-profit organizations. Please contact us for further details. We also accept donation requests. Depending on the nature of your charity, event, or team we may either approve your request for a donation or suggest an E-Z UP sponsorship. You can check out the organizations we sponsor here. You can view your recent order information by logging into your ezup.com account here. Unfortunately you cannot change your order after submitting it. Once an order is placed it is immediately sent to our warehouse for processing. You can place a new order for the additional products needed. How do I wash the top/sidewall/table cover? We recommend using a non-abrasive cleanser and scrub brush to gently spot clean the top of your shelter. Do not put the top in any washing machine as this may damage the coating(s) we apply for water and fire resistance, mildew resistance and UV inhibitors. Wash off soap and allow fabric to air dry completely before storing it. Excess water may cause mildew to grow. Can I use a seam sealer or water proofing spray on the top? You may apply any water proofing agents made for waterproofing tents and awnings. Please note however, the primary function of the shelter is to provide shade. Can I send my E-Z UP Shelter in for repair? E-Z UP provides replacement parts for many components of your shelter. Please go here. If you need assistance in determining which part fits your needs, our Customer Service team is always here to help. I have holes and/or rips in my top. What is the best way to repair? Repair kits for your top are available. Depending on the age and condition of your top we may suggest purchasing a replacement top. See E-Z UP Replacement tops here. Who do I contact if I have any questions or problems? All E-Z UP® products are constructed with the highest quality materials and are thoroughly inspected before being shipped. Should you happen to have any questions or concerns, please contact our expert Customer Service Department who will answer all your questions. All E-Z UP® products are backed with a 1-7 year warranty depending on the shelter model or product. What is the E-Z UP warranty service process? This document outlines the warranty service process. Please contact us at +31 (0)30 63 541 00 should you have any questions. How long do I have warranty? The warranty for each product varies depending on the model or type of product. Please visit this page to find your product. Warranty periods are listed under the Additional Info tab. What type of custom printing options do you have? E-Z UP® is recognized as a world leader in custom printing, winning the Specialty Graphics Imaging Association (SGIA) Golden Image Award for digital printing excellence three years in a row. Our expert Custom Department can turn your logo or image into a brand building, attention-grabbing shelter. Choose from a vibrant spectrum of colors to design a shelter that is completely unique and custom-crafted for your needs. 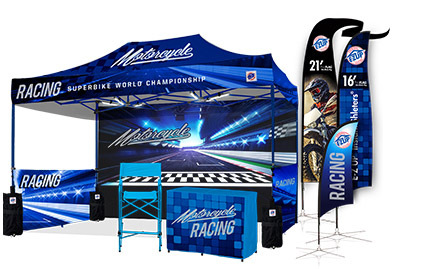 We also offer a complete line of shelter accessories as well as banners, flags and table covers. See our Custom Graphics page for more information! How do I order a shelter with custom graphics? Please contact our Custom Department for all inquiries and orders. Our Experts are ready to help you select the E-Z UP® Product that is right for you and to assist with the design using your graphics. We provide renditions free of charge so you can visually see what your custom E-Z UP® product will look like before you order. What file format do you need my artwork in to print? Artwork needs to be in vector format so it can be scaled to size and print on a large area without reducing clarity or becoming pixelated. These file types typically have the extension .ai or .eps. Please see artwork requirements here. Artwork for custom printing can be sent to euinfo@ezup.com. Please reference your contact name and quote number (if available). Unfortunately, we do not make custom or special sizes. Please contact our Customer Service team and we can help you find the best E-Z UP® shelter or products to fit your needs. How can I check on my delivery status? After your order has shipped you will receive a confirmation email with a tracking number. You can also find shipping information by logging in to your account here. If you still have questions regarding the status of your order please contact our Customer Service team. We offer replacement parts here. To identify the part you need, you must know the name or model number of your product. For a shelter product, model numbers can be found on a sticker adhered to the frame leg. Click HERE to see an example of a frame label. For all other products, please locate your product here or go directly to our parts page here. If you have additional questions, please call +31 (0)30 63 541 00. Can you help me identify the name of the part I need to repair my broken shelter? Our full E-Z UP® Instant Shelter® diagrams will help you easily identify and name the location of your replacement part. Need more help? Contact our Customer Service team. How can I sell or resell E-Z UP® products? Thank you for your interest in becoming an authorized dealer of our E-Z UP brand products. We have a complete reseller program designed for all types of businesses. To learn more, request information and discuss qualifications, please contact our Dealer Department +31 (0)30 63 541 00 or read more here.